Scribblenauts Showdown Review | Fun for the whole family… especially if you’re all 12 years old. Great concept, falls short on execution. When Scribblenauts first launched, you could say that it was a triumph for the puzzle genre. With its innovative mechanics and engaging gameplay, the original title received praise worthy of the fantastic game that it was. As a kid, you always wondered “what if I could draw something to life” and with Scribblenauts, you are only limited by your imagination, and the vocabulary set of the game. 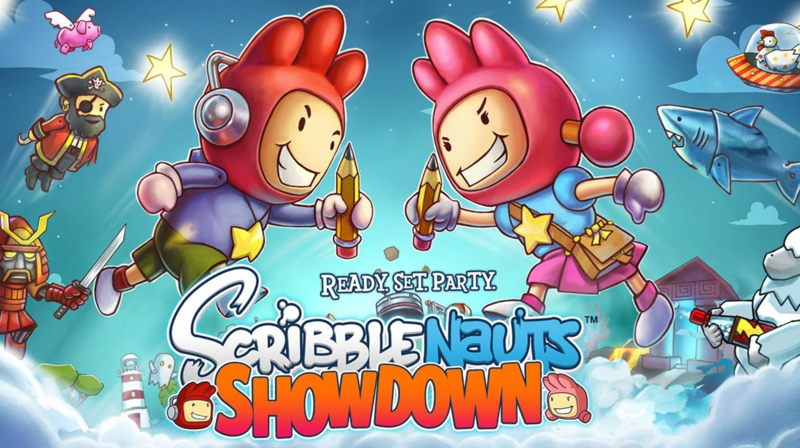 Years after the last game, we are treated the latest offering called Scribblenauts Showdown. Good? Bad? Check out our review! First off, the game looks adorable. In true Scribblenauts fashion, the whole world and its characters really come alive even with its cutesy art style. Kids will love the colorful settings and characters while adults will come to appreciate it in context of the game. There are a few modes you can venture into Scribblenauts Showdown, with the Showdown mode being the main course. If you’ve played Mario Party or any game of that sort, you’ll be pleased to know that Showdown takes on that mould, with up to four players facing off in a board game-esque platform that will have you racing to the end. There are 2 types of mini games, “Wordy” mini-games require unleashing the best object or character from the vast Scribblenauts dictionary, and action-oriented “Speedy” mini-games that require you to finish a challenge first. There are a lot of mini games to play across Scribblenauts showdown, and while there are exceptions, most of the offerings are, sadly, repetitive do not offer much in the fun category. Some require you to tap button directions ala dance dance revolution, some will have you collecting items to fill up a black hole and while they may sound fun, actual gameplay is a very different experience altogether. Versus mode is basically Showdown, but this time you go head to head with another player as you shuffle through one mini game after another, gathering the most wins to be declared the winner at the end. If you’re looking for some classic Scribblenauts gameplay, the Sandbox mode would be your weapon of choice. You’re dropped into a stage wherein you’ll have to make various NPC’s “happy” by solving their problems using your scribble mechanic. It’s actually fun and you’ll find yourself wanting to go through each stage to experience and solve all of the puzzles, but with only 8 stages worth of content, you’ll be able to finish Sandbox mode (and the entire game for that matter), in maybe 4-6 hours tops. Playing through these modes will give you “Starites”, the currency that you’ll need to collect and use to purchase character unlockables, among other things. There are a lot of things to unlock and customize your character with, you can even choose to create your own character if you don’t want to use any of the existing templates. With quite a number of things to use your Starites on, my main gripe comes with the fact that you’ll need to play through the modes over and over to collect Starites, but doing that will run you through the grinder again. You’d expect that the games should be fun and exciting enough to play through again and again, but with only 27 games to go through and 8 sandbox levels, the game gets repetitive and tedious quickly. I’m maybe expecting an update eventually, adding more mini games and Sandbox levels to the mix, but until then, the paltry amount of levels will have to do. With such a great concept, I’m surprised that they didn’t add more content to it, and with the fact that the game is priced at 40$, it’s quite hard to justify it at that price point. Maybe a couple of free downloads down the line, I’d be willing to plop down that cash for the game but at the moment, it’s quite a tough sell. 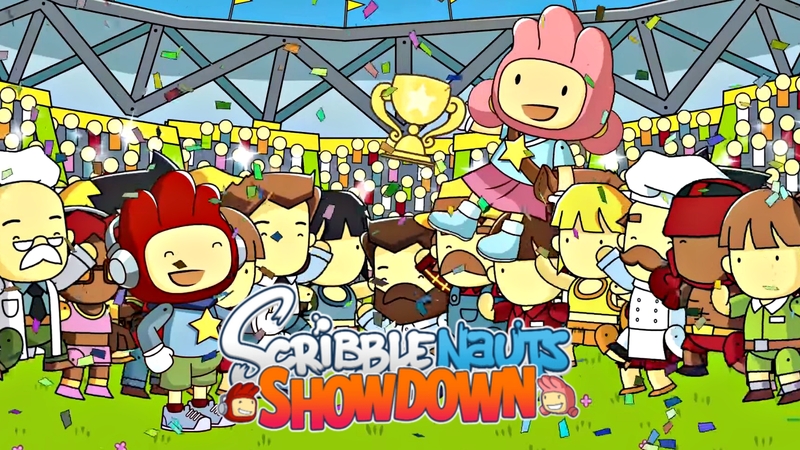 Scribblenauts Showdown could have been really good, but instead falls short in its execution. Employing a Mario Party-esque showdown mode sounds like a fantastic idea, but it’s the mini games that are the shaky piece of the puzzle to this game when it was supposed to be its shining star. Most, if not all games, are not fun even with the scribble mechanic implemented. They feel very repetitive and whatever item you choose to draw really doesn’t give you a tangible advantage. Majority of the game feels incoherent and as someone who played the 3DS game for quite a bit, this entry in the series is unfortunately not an improvement despite appearing on the current generation consoles. Scribblenauts Showdown is out now for the Playstation 4, Xbox One, and Nintendo Switch, only from Warner Bros. Interactive Entertainment! *The game was played and reviewed on a PS4 Pro using a review copy provided by the publisher. Scribblenauts Showdown could have been really good, to be honest, but if you're looking for classic Scribblenauts goodness, best bet is to go back to Super Scribblenauts (3DS) or Scribblenauts Unlimited. Showdown is fun, but after a couple of hours of gameplay, it's really not something you may go back to due to it's unattractive mini-games and mild replay factor. Previous articleApocalypse again? Well then it’s time for an Uprising! Pacific Rim: Uprising hits theaters nationwide soon!